You may have heard that this month is National Stress Awareness month here in the UK, though I’d forgive you for not noticing due to the amount on our plates at the moment! Us small business owners have a lot to juggle; clients, admin, accounts… not to mention the kids and remembering to eat lunch! Perhaps it’s pertinent that Stress Awareness Month has been held every April, since 1992. After the chaos of Christmas and New Year hibernation, spring is a period for most of us to attack things with lots of energy, and dare I say it… take on too much? According to the Mental Health Foundation, 74% of UK adults have felt so stressed at some point over the last year they felt overwhelmed or unable to cope, and millions of us around the UK are experiencing high levels of stress, damaging our health. Stress is one of the great public health challenges of our time, but it still isn’t being taken as seriously as physical health concerns. 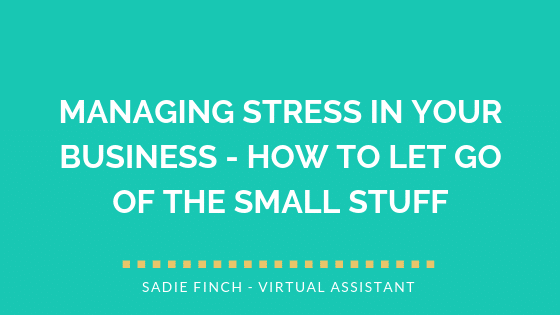 This month, I’m sharing a mini-blog series on helping you manage the stress in your business, starting today with the small stuff. You know, the little niggles that you bump down your to-do list and the underlying minutiae that don’t seem that important, and yet they still manage to whizz around your brain at 4am? I read this article recently that highlighted the age-old saying “don’t make a mountain out of a molehill” and truthfully, I agree. There are bigger things that should take up our mental energy than being stuck in traffic, suffering from a bad hair day or showing up a few minutes late for dinner. I’m talking boundaries here (you may also like this article on boundaries from Rachael at Simplified Accounting!) – what do you need to do that serves you? A client can wait a couple of hours if it means you get to take a lunch break away from the screen, and if you feel best starting work at 10am instead of 8, go for it! You are your own boss after all. You may have heard this before but if there’s something there that’s getting you down, just get it done! Make that 3 a 1 and tick it off your list so that you can clear mental space for the rest of the day. It can be easy to let a little irritant get us down and loom over the day, and we can’t see the wood for the trees. Take some time out, do something different and try and see things from a different light. Sometimes it simply takes a different viewpoint to see that it can be done differently, or it wasn’t so bad after all. I would love to know what you do to help practice mindfulness and let go of the daily work stress this month! Have you passed or delegated any tasks, or do you have any tips or tricks for me to add to the list?